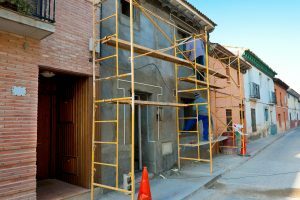 Information about Scaffolding Accidents and Lawsuits | Craven, Hoover, & Blazek P.C. Construction workers, especially the veterans, fully understand the risk they take on with their line of work. And for anyone that is considering joining the construction workforce, it is recommended to examine these risks before making any final decisions. This is because the construction industry can be extremely dangerous. Workers can be exposed to several environmental hazards on a daily basis. Harmful chemicals, extreme heights, heavy equipment, over-exposure, and much more are just a few threats that constructions workers face every single day. And because of these dangers, construction employees are injured frequently. In some cases, serious accidents occur, causing severe injury or even death. One of the most common construction accidents involves poorly maintained and defective scaffolding. Scaffolding is a necessary tool in the construction industry. It is used to allow access to all interior and exterior areas of a structure, for painting, sealing, and other types of construction work. Because they are used as such great heights, accidents are often serious, if not fatal. In fact, it is estimated that more than half a million construction workers are injured each year as a result of faulty scaffolding. Although there are strict industry regulations for setting up scaffolding, many construction companies cut corners when it comes to proper scaffolding installation. Missing parts, missing or loose guard rails, missing side brackets, plank failure, missing base plates, and standard slip and falls are the most common reasons why scaffolding accidents take place. These are the areas where the negligence can occur. It can also occur at the hands of the manufacturer if the product, in this case scaffolding, was delivered defective. It can also be a result of employee negligence if a few decide to not follow proper installation instructions. 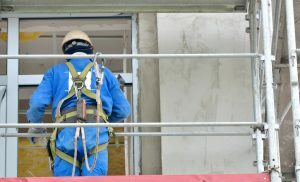 There are several cases of negligence that can occur when it comes to scaffolding accident, but in all cases, victims should be fairly compensated for their injuries. Just because you know your construction job comes with risks, doesn’t mean your employer is off the hook for any personal injuries you sustain on the clock. If you were recently injured at a construction site, contact a licensed construction accident lawyer for help navigating your company’s workers compensation system. They can ensure you receive full and fair compensation for your damages. Craven, Hoover, and Blazek P. C.
Call Craven, Hoover, and Blazek P. C. at 317-881-2700 and speak with a licensed construction accident lawyer in Indianapolis, Indiana. Ask for seasoned attorney, Daniel Craven, and receive a free initial consultation to discuss your injuries and determine your eligibility for remuneration. We never collect lawyer fees unless we recover compensation for you. Call 317-881-2700 to learn more about construction accident lawsuits in Indianapolis, IN. This entry was posted in Construciton Site Accidents and tagged accident lawyer Indianapolis, construction accident lawsuits Indianapolis, construction accident lawyer Indianapolis, Construction Scaffolding Accidents, Construction Site accident attorney, workers compensation lawsuit, workers’ compensation claims. Bookmark the permalink.